Charleston County brags on the Academic Magnet High School. Why shouldn’t we? It’s the crown jewel of our public school system. The best public high school in the state regularly makes the top ten in the nation, according to U. S. News and World Report. Sure, our school choice policy might be killing North Charleston and Stall, where the hallways echo from disuse. (If you haven’t read the Post & Couriers‘ “Left Behind” series, check it out–the paper deserves another Pulitzer Prize for that reporting.) Maybe only a quarter of the county’s seniors are ready for college science courses. We might have some schools (like Burke) at which not a single graduating senior is rated ready for college. Not one. But we’ve also got the Academic Magnet, and we can crow about that. Bailey’s no light-weight. He used to write for the Boston Globe. He wrote for Bloomberg News’ London bureau. So he’s got the keen eye of the professional journalist, another veteran, big-city pro, like Doug Pardue, who settled in Charleston. But Bailey’s no outsider either. He grew up in Mt. Pleasant, when that city was a small town of a few thousand people, and his love of the Lowcountry brought him back from London. He’s family. When he calls us out in the P&C, it’s like we’re sitting around the kitchen table frankly discussing our family problems. And the latest family headache is our golden child, the Academic Magnet. The Academic Magnet only serves white families. It’s designed to exclude African Americans. How do we know this? Because the school does not enroll black students. Last year, less than 3% of its student body was African American. That’s 16 students out of 664. In a school system where 42% of the students are black, enrolling 3% is segregation. Token blacks. You can’t get that result with a truly color-blind admissions system. You have to do it on purpose. So who do we blame? Principal Judith Peterson doesn’t know. Certainly she’s no racist. Nor is the faculty at the Magnet racist. Nor those who make admissions decisions. Nor is the all-white board of the AMHS Foundation. “Cultural diversity” is one of their goals. Yet, year after year, the story stays the same. Or it gets worse. No one seems to know why. Peterson shakes her head and disowns responsibility. It seems that no one’s to blame, except maybe history. Only in this case, history is not ancient. It’s not ante-bellum. It’s not even Jim Crow. It’s Larry Kobrovsky. 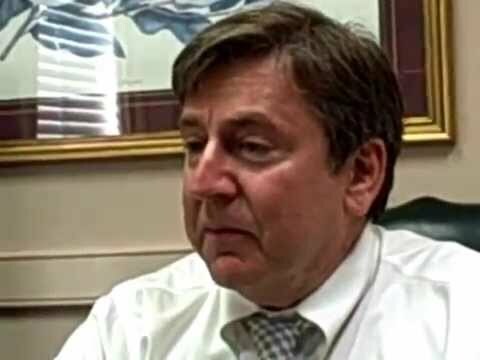 Kobrovsky is the chairman of the Charleston County Republican Party. When he speaks, it’s as if the silver voice of Reason speaks. Here’s his interview with Quintin Washington from a couple of months ago in which he defends Donald Trump’s proposal to ban Muslims from the United States. If you watch the video all the way to the end, you’ll see Kobrovsky, in very reasonable tones, suggest that the United States is at war with Islam. Then he’ll very reasonably compare Muslims to Nazis. That sure sounds reasonable, doesn’t it? South Carolina is undeniably different today. For instance, in 1965, we sent no African Americans to Congress. Now we’ve got Senator Tim Scott and Rep. Jim Clyburn. That’s ample evidence that South Carolina can be trusted to pave all paths to the voting booth. Except for citizens who don’t have a driver’s license. Their path should be blocked. That should go without saying. Excluding them is perfectly reasonable. After all, they couldn’t fly on an airplane, so why should we let them vote? And all those older, poor folks who don’t have birth certificates? We have to balance their right to vote against the very obscure, unlikely, but (in a technical sense) very real possibility that someone might try to vote illegally. Nothing unreasonable about that. Nothing racist about it either. It’s not like most of those people who don’t have government-issued picture IDs are black. And what do these folks add up to anyway? Only a couple of hundred thousand in South Carolina. So what if nearly three-quarters of non-white voters in Orangeburg County would be barred from the voting booth. It’s perfectly reasonable to hinder them from voting. After all, given a chance, they’d probably vote for Democrats. So why should the feds need to supervise our election rules? To the left you see a graph of county-wide proficiency or lack of proficiency in English and Math among high school graduates. Each blue dot represents a high school. There’s a cluster down near the bottom–those are the black schools: from the bottom up, North Charleston, Burke, Stall and Greg Mathis, Garrett Academy, St. Johns, Lincoln, Baptist Hill, and the Military Magnet. The only integrated school in this cluster is West Ashley, whose students are about as non-proficient as Baptist Hill students. Then there’s the “achievement gap.” Above 3.0 are all of the other integrated schools–again in ascending order–James Island, the Charter School for Math and Science, Wando, and the School of the Arts. At the very top, above all the rest, is the all-white school, the Academic Magnet. How can that be? The Magnet used to graduate plenty of college-ready, high-achieving black students. Until Larry Kobrovsky wrecked that tradition. He did in perfectly reasonable fashion. It’s the same use of “reason” that rationalizes voter-ID laws. Charleston County’s premier, magnet middle school, Buist Academy, the direct line to the Magnet High School, used to aim for racial diversity. Intentionally. Explicitly. Its admissions criteria tried to reproduce the racial ratios of the Charleston peninsula: roughly 60% white and 40% minority. Its method was simple, crude, and blunt: quotas. It created two pools of candidates, white and minority, and reserved percentages of seats for each. Until 2002. In October of that year, three white families alleged that their children were excluded from attending Buist because of their skin color. Kobrovsky was their lawyer. Part of Kobrovsky’s case relied upon the definition of “minority.” While CCSD might have had a “history of systemic discrimination” against blacks, and the state might have have a “compelling” interest to overcome that history (though Kobrovsky hardly concedes the point), Buist’s admissions policy applied its minority quota to Hispanics, Native Americans, and Asian/Pacific Islanders. The state, Kobrovsky argued, had no “legitimate . . . much less . . . compelling” interest to assure Hispanic or Native American students access to Buist, since no one has ever proven discrimination against those groups. Wouldn’t it be much better–and much more American–to ignore race all together? How better to assure that students are selected according to what Kobrovsky called their “own merit[s]”? The school district backed down. Scared by Kobrovsky’s lawsuit, Buist abandoned its clumsy quota system in favor of supposedly color-blind criteria. The result? According to the U. S. Department of Education, Buist went from 129 black students in 2001 to 55 in 2014. In 2001, 243 were white, and by 2014 that number increased to 359. Today, about 12% of Buist students are black. And Buist is the County’s surest path to the Academic Magnet, which went from 133 blacks in 2001 to 16 today. It seems we can draw one of two conclusions from this data. Black kids have less individual merit than white kids. Or the way Buist and AMHS measure one’s “own merit” is not really color-blind. AMHS measures merit in four ways–grades, letters of recommendation, an essay, and the ACT’s Explore achievement test. Three of those four select more for privilege than personal merit. The 8th grader from Buist, who more than likely is an upper-middle class white kid, has a huge advantage over the kid from Morningside Middle, where three-quarters of the students are black and 95% are on free-or-reduced lunch. It’s not that the Buist kid has no merit, but his way is grooved for success. He might have his shoulder to the stone. He is moving it along. But he started at the top of the hill. Gravity’s helping. And his road is paved. The kid from Morningside is pushing her stone uphill, like Sisyphus, over a pathless ground. She’s moved her stone. Not nearly as far as the student at Buist, but she did it with much less help. Clearly, each child’s personal “merit” is not equivalent to the distance each moved that stone. Take the personal essays. I have seen the biases at work. One of my kids went to Buist and another to C. E. Williams. Buist guides students through the AMHS application process, grooming them along the way, looking at draft essays, and coaching students how to write them. Its faculty live in a culture that produces letters of recommendation. C. E. Williams does nothing. No coaching on essays. No letter-mill grinding out recommendations. Its grooves lead students right to West Ashley High. We know that test scores are even more biased. Tests like the ACT supposedly measure academic “achievement.” Your score indicates how much you know. But it disregards whether your path to that knowledge was uphill or down. So it’s absurd to say the ACT’s Explore test in any way measures someone’s “own merit.” Nor does it predict a student’s future likelihood of academic success. It measures one’s access to knowledge, which in this county tracks roughly but pretty consistently onto one’s level of wealth. Nor is wealth color-blind. According to the Anne E. Casey Foundation, in Charleston, just 5% of white children live in areas of concentrated poverty, while 44% of all black school children live in such areas. When you select for wealth in Charleston, you’re selecting for white kids. Larry Kobrovsky, who claims to abhor unequal treatment, has not leveled the playing field. He’s devised a system that tips the field in favor of families like his own. Ten years ago, 13% of AMHS students were on free- or reduced-lunch. Today that figure stands at 3.6%. So here’s the real scandal: almost half of all students in public schools in Charleston County are poor: 48%. The Academic Magnet assigns these kids just 4% of its seats. The pre-Kobrovsky method of selection at Buist reserved 40% of the school’s seats for minorities. Even that system benefitted white families. Whites, who comprise about half the students in the district, were guaranteed 60% of the seats. We’ve replaced this color-conscious system of quotas with a process that has very effectively reserved 96% of the Academic Magnet’s seats for just half of the district’s students: kids from middle- and upper-class families. Talk about quotas. This is the Kobrovsky Factor: a policy that abandons one type of affirmative action and installs another. As a way of selecting students, it is just as biased as Buist’s old quota system. In fact, it’s significantly more biased. The difference is Buist used to be open and explicit about its quotas. The Kobrovsky Factor works in the shadows, by stealth, by pretending it’s based on “merit.” It’s a wolf in sheep’s clothing. It is bias dressed up in the 14th Amendment’s guarantees of equal treatment. Maybe I’m laying it on too thick. While the threat of voter fraud is so patently bogus that it might lead any truly reasonable person to suspect Kobrovsky’s motives, there’s no evidence that his lawsuit against Buist is disingenuous. I can believe that Kobrovsky believes that our county’s rich white kids earn their place at the Academic Magnet and that our poor black kids do not. He might honestly forget about privilege and advantage when talks about someone’s “own” merit. But motive is irrelevant. A policy can be racist when those who design it and execute it are not. Applied in the context of Charleston County, the Kobrovsky Factor selects for whites. It has segregated the Academic Magnet. First of all, dump standardized tests as any part of admissions to Academic Magnet. Dump the essay. Dump the teacher recommendations. In other words, focus on the best measure we have of a student’s personal merit–their grades. Ignore the reputations of the various middle schools. Treat an “A” from Morningside the way you’d treat an “A” from Buist. Some say that will lower the school’s standards. That AMHS won’t rank as high in U. S. News and World Report. I doubt that’s the case. Nearly ten years ago, when the Academic Magnet first broke into those rankings, it was much more diverse than it is now. Anyway, what if it did fall out of those rankings? So what? The school’s mission says nothing about national rankings. It does promise to cultivate diversity. Get involved. 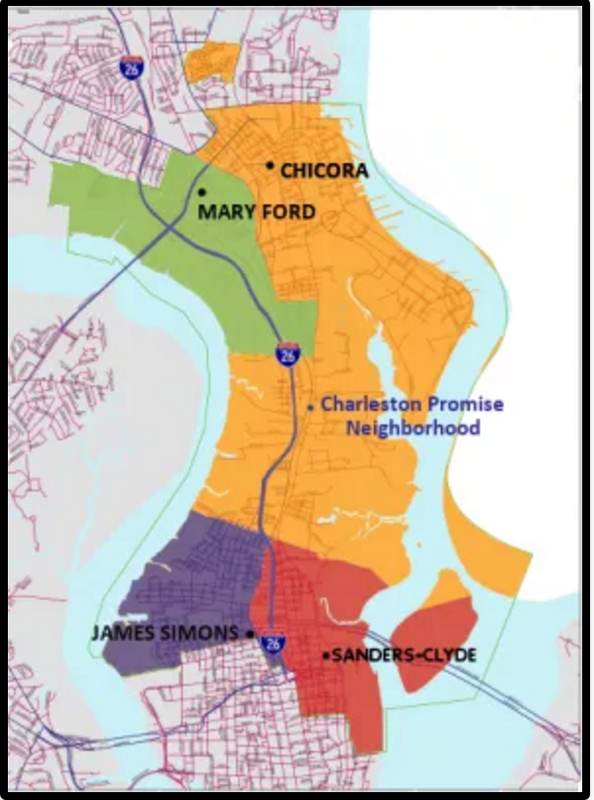 Support the Charleston Promise Neighborhood (pictured to the left), one of those “areas of concentrated poverty” that maps pretty clearly onto race. Join the local Quality Education Project. Pay attention to school board elections. Vote against anyone Kobrovsky supports. If you’re a Republican, dump Kobrovsky and his ilk from the party leadership. Finally, listen to the nearly-all-white students at the Magnet. They’ve got great ideas–in fact, they seem far ahead of the school’s administration in addressing the problem. *There’s not much to find about the bias or fairness in the Explore test itself. Apparently, it’s not been much studied. But Explore is the 8th-grade version of the ACT test used for college admissions, and there’s a lot of data on that test. My link points to one critical website among many. « Is Donald Trump a Fascist?